We eventually made our way to a place called Nyack. There was much debate amongst the crew about how Nyack was pronounced. There is a beautiful mountain with steep rock cliffs coming down into the water. From an anchoring perspective it was completely unprotected from almost every direction, but as far as I knew the weather was going to remain calm so we anchored for the night near the beautiful cliffs. Our starboard engine had stopped pumping water, and I assumed we had caught one of the many plastic bags (or condoms) that float in the Hudson River and that it was plugging up the raw water intake. So once we had the anchor down I jumped in the water to check it out. Nothing wrapped around the sail drive, but it was covered in mossy growth, so I assumed that was the problem. I cleaned it up, turned on the engine, and water pumped out. Awesome. I assumed the problem was fixed (it wasn't). I woke up at 5 am the next morning to the sound of waves thumping against the stern of the boat and the anchor chain rubbing against the hull. The tide and the wind were working against each other causing the boat to sit funny. I might have been able to ignore the waves, but I couldn't stand the idea of the anchor chain rubbing against the hull and I figured it would be nice to get an early start on the day, so I got up to get the boat moving. I didn’t want to wake anyone up by starting the engines, so I planned to sail off the hook. I pulled the anchor up by hand (as quietly as possible, which is pretty loud). We didn't have an anchor windlass on our last boat, so I always hauled it up by hand, and I don't remember it being so hard. Either I'm getting soft, or something is making it harder. One difference could be the all chain anchor rode. On the last boat we only had around 20 feet of chain, the rest was rope. Another difference could be that the catamaran itself is heavier, and harder to pull through the water. Once I got the anchor up, I unfurled the jib and sailed off. There were many twists and turns in the river, and eventually we had to kick on an engine. I opted for the starboard engine, wanting to test my theory that I had solved the cooling water problem. Water indeed flowed out from the exhaust, but I kept a wary eye on it, and before long the engine started to emit what I thought was white smoke. After a closer look and consulting with my buddy Eddie, I concluded that it was actually steam. I switched over to the port engine and as we continued on I started thinking about a visit to the mechanic. We traveled about 60 miles to Esopus Creek. Again there was debate amongst the crew about how Esopus was pronounced. Once we arrived I jumped in the water and spent the next hour letting Hobie jump off the back of the boat into my arms. It is a heck of a workout to tread water while having a 25 pound toddler jump into your arms every 3 minutes, who then has to be lifted out. Repeat, repeat, repeat. But he LOVED it, so it was worth it. The next day we headed for Riverview Marina in Catskill to get the mast dropped. We then headed north to Waterford, NY, the entrance to the Erie Canal. We were really excited to get there. For one, we had some cruising friends from the Bahamas we wanted to meet up with. They were leaving town the next day, so this was our only opportunity to see them before they left. We were also excited because it meant the beginning of the new leg of the journey, and the start of making some serious mileage westward towards home. We still have a long way to go, and there isn’t much of summer left. We want to get the boat to the Great Lakes so we can slow down a little and just take a breath. Spend a few days somewhere just because we aren’t in a race against Jack Frost. It would also be great to get to do some swimming in the clean, clear, fresh Great Lakes water while the weather is still nice and warm. Uhh… what? I just sat at the helm, the boat floating in idle… staring at the hobo shacks on shore, processing what this meant. It meant the boat would have to stay somewhere in NY. It meant finding a way to get all our stuff home. It meant coming back out to NY next summer, but we can’t do that. We expect LeeAnn to be very pregnant next summer, or we might even have an infant. Either way, we wouldn’t be able to leave for a boat trip. 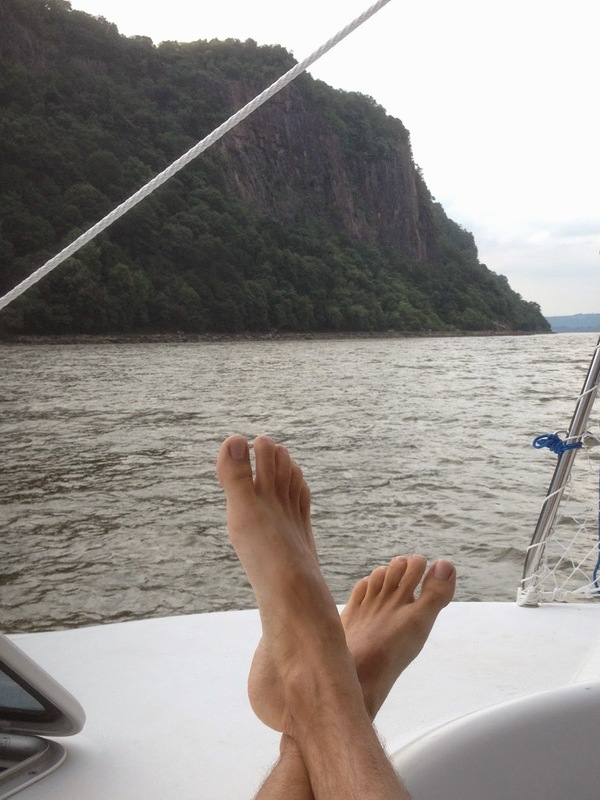 So… we would have to leave the boat in NY for the next two years until both kids were old enough to travel on a boat? I called the lock tender on the phone. At first he was reluctant to talk to me, but eventually he started to open up. He explained that the “coin” which is the metal plate that the lock door swings on was broken. It was putting too much pressure on the lock door, and they had broken both the main, and backup hydraulic arm. He couldn’t open the door even if he wanted to. 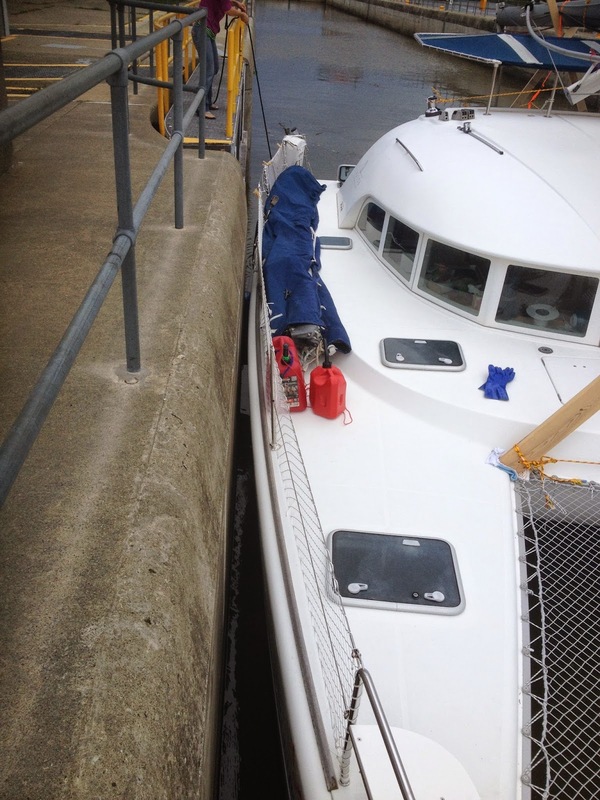 He said the lock door was 22 feet wide, and the widest boats they were allowing was 20 feet. I told him that was perfect, because we are 20 feet wide! We’re actually 21.5 feet wide, but math is math, I knew we could fit and I figured if he let us approach, by the time he realized how tight of a fit it was going to be, would would already be 3/4 of the way through and he would have to just let us complete it. He said we could call the morning lock tender and ask him. We dropped anchor in the river, not knowing where else to go. I had planned to go to Waterford, I didn’t anticipate that we would get within 3 miles and then have to find another place to stay. There were some free, public docks in the area… but we would have been the only boat in a remote, not-so-friendly looking place, so we decided it would be better to just drop the hook in the middle of the river. I rushed to fire up the engines and haul up the anchor before he changed his mind. It was the upper gate that was broken. We entered the lock, rode up, then walked the boat forward through the broken gate. It was tight, but we made it! The trip is back on! Hi, I'm contemplating a similar journey into the Great Lakes one day and am curious about your mast. Did you ship it after it was taken down in Catskill? If so, where did you have it put back up? We set it in a cradle on top of the boat and transported it ourselves. I've heard of people shipping them, and that sounds really nice. I'd probably get on cruisersforum.com or something to see if you can get a group of people to lower the cost. We put the mast back up in Buffalo, NY.